agencies. Her vision and steadfast demand for excellent design has helped drive the creative team forward to becoming an internationally recognised, award-winning creative agency. In 2012, Mary opened Red Dog’s New York based office to cater for the non-profit sector primarily. Recently Red Dog delivered a large rebrand programme there for global charity Jhpiego. Mary has a significant level of expertise in developing brands that are now ready to move on, re-invent themselves or have found that they have simply ‘outgrown’ their current visual and verbal brand identity. Mary is a qualified designer herself but now spends her time leading projects, working directly with clients and managing multiple stakeholders, running presentations and keeping a high level eye across the whole project from beginning to end – as well as running a successful company. 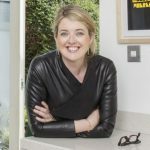 Mary has won many awards both in Ireland and abroad over the years and continues to do so for her work in brand identity programmes, PLC annual reports and many other forms of campaigns and projects.